These were reasons I could have not been nervous… Alex and I have rolled quite a bit together at Plus One, and I used to be able to say “I know his game.” More often than not, I’ve gotten the tap, historically, when we’ve sparred, likely because I have simply trained for much longer than him. 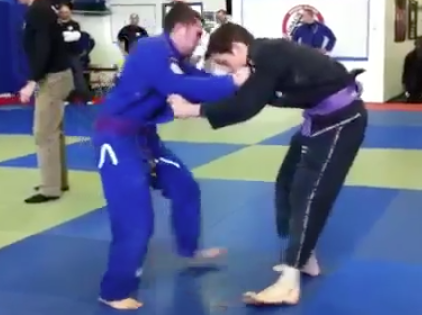 His purple belt is comparatively new, and he was bumped up to my weight division, putting him at a size disadvantage. However, Alex is a wrestling coach, so better at his takedowns than I am, he’s masterfully technical on the ground, as all small players become, and we haven’t rolled together in (maybe months?) Meanwhile, he is on a heavily competition-focused team with a world-class instructor whose team has been sweeping local tournaments, from the Facebook postings I’ve seen. I had to assume he was not to be taken lightly. This was no slam-dunk, nor did it feel like it when we rolled. Alex had great takedown attempts! I really had to react quickly to stay on my feet. My reactions are only whatever I instinctively did in that moment (usually create distance and base heavily to one or both feet as much as possible). My intention was to be grounded above all else. As we worked from feet, I noticed, almost in a third-party narrator’s voice, that adrenaline was significantly strengthening my gi grips, and hoped I wasn’t exhausting my hands but couldn’t feel it. My takedowns were submission attempts, combining the takedown with the armbar attempt. I am comfortable with this takedown, and it improved a great deal when I really learned to create centrifugal force to off balance my opponent to guarantee my opponent end up in my guard if nothing else. 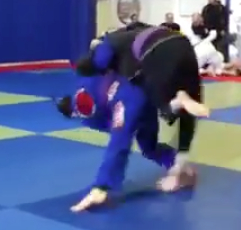 My first takedown put us in guard, where Alex was too savvy to be gi-choked, but I bumped to mount successfully. From mount, his elbow escape was underway with haste, but I pinned his head facing the other direction with my head, again hoping that I wasn’t using more force, because of adrenaline, than was cool. From here, I stepped over for triangle from mount, a decision that I attribute to working with my training partner Joe Duong on it recently. I heard the approving commentary of Jay at this point, and felt good to have my corner there. There is definitely something heartening about having someone there encouraging or coaching you during a match. This was the moment I realized that, because our match was first up, we had a big crowd, and lots from Gracie Farmington Valley. This offense went back and forth from being a triangle attack to an armbar attack, until Alex’s quickness kicked in as disentangled himself, and we were back to our feet. My second takedown was much closer to a good armbar set-up, but Alex had good base, and started to stack. From here, looking back at the video, I see that I did something I don’t recall, and used one hand to keep pressure on the head-hooking heel while using the other to off-base him into a supine armbar-setup position. It was from here that I ultimately sat back with the arm, and, upon resistance, turned it into a wrist lock. This match was a battle during which I never felt completely safe, and Alex is a dangerous venus fly trap of technical skill I can’t wait to roll with again soon.